When you have purchased a new TV, or are moving your existing set, Ebuyer has a full range of television accessories including many different wall mounts, TV stands and even 3D glasses . Our selection of wall mounts, cabinets and stands provides a range of choices, helping to ensure that your TV is in the right position and looks great with the rest of your decor. The most popular of these products are the mounting brackets, which allow you to seamlessly attach your television to a wall. Options include static wall mounts and cantilever designs, as well as adjustable models. Other television accessories include universal remote controls and we also offer home cinema equipment like DVD players and surround sound, so you can enjoy the best entertainment system at a low price. More and more of us are now mounting our televisions on the wall. It saves space, looks good and can be fixed at the ideal viewing height. 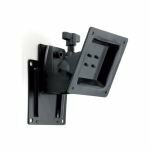 And here at Ebuyer.com we have a large range of TV wall mounts and brackets that can be used for all VESA compatible televisions and large screen display panels. The new generation of mounts and brackets make it much easier to fix the TV to the wall but we also have plenty of stands and cabinets to choose from if you prefer that approach.